My climate is NOT a lie. Full of loss and extremes. What it means to be planning. But how can they help? A word cloud featuring the words that appeared on the LED display board on the Platform Building in Leeds during Green Great Britain Week; the larger font the more regularly the word appeared (Image Credit: James Norman). 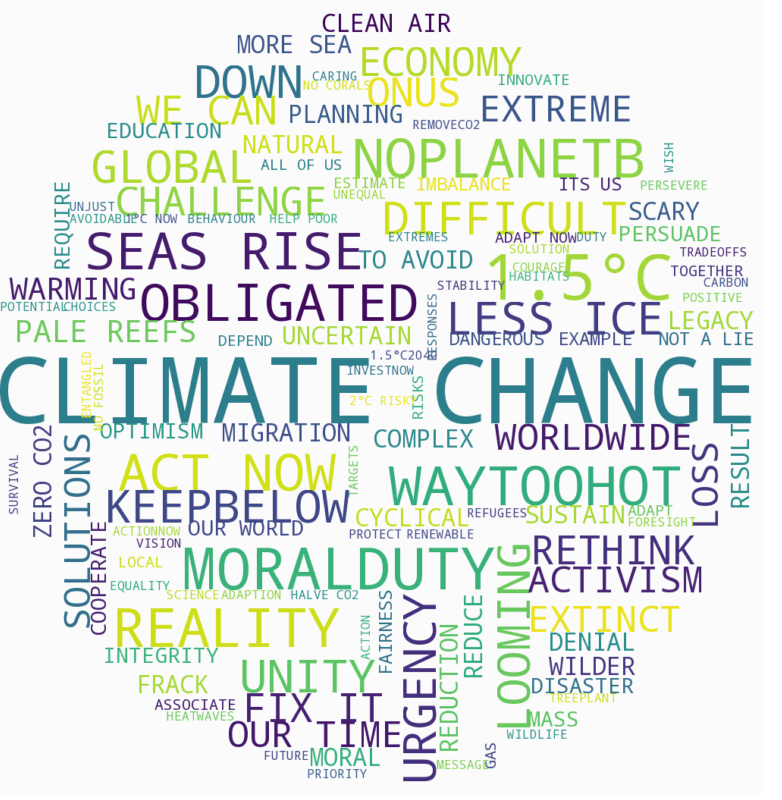 This is a digitally-curated found poem, created using responses from the MyClimate Twitter campaign that was run by the Priestley International Centre for Climate and Leeds Climate Commission during Green Great Britain Week in Leeds 15-19 October 2018. During this campaign, members of the public tweeted using the #MyClimate with their responses to the question, “What does climate change mean to you?”. The words were displayed in 2m high LED letters from the windows of the Platform Building in Leeds, adjacent to the train station – spelling out a collective vision of what the climate meant to people, what it was now, and what it could potentially be in the future. This poem contains both the words and phrases that appeared on the board (which was limited to nine characters), and those that were contained within some of the longer tweets as well. Read more about it here.